Try Germany's most popular cake at your next holiday gathering. Known as Der Konig der Kuchen, Tree cake, the king of cakes, and spit cake. We ship this all across the USA. A true test of a pastry chef's skills. The baking of this traditional Polish and German cake requires a special wooden log that spins round on a long spit in a very high temperature during the process. The dough drops fall onto the log and get baked in a form of amber. This labor-intensive specialty gets it name, which translates literally as "Tree Cake", from the many thin rings that form as layer upon layer of cake is baked. 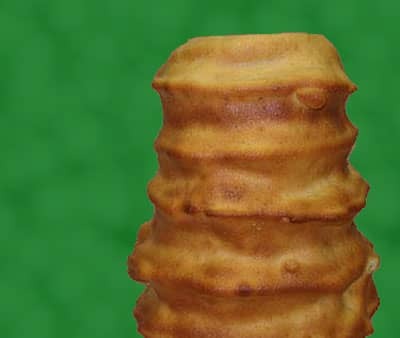 Baumkuchen (Sękacz) is a unique looking pastry. It stands approximately seven inches tall and is a real decoration for any celebration table. It is also a delicious traditional Polish and German dessert and excellent sweet gift.